Nov, 13, 2014 — Jaclyn Friedlander saw the email inviting Santa Monica Pier Aquarium volunteers to build a Rube Goldberg Machine for this Saturday’s S.T.E.A.M. Machines event on the Pier and took the challenge to her most creative and handy friends. 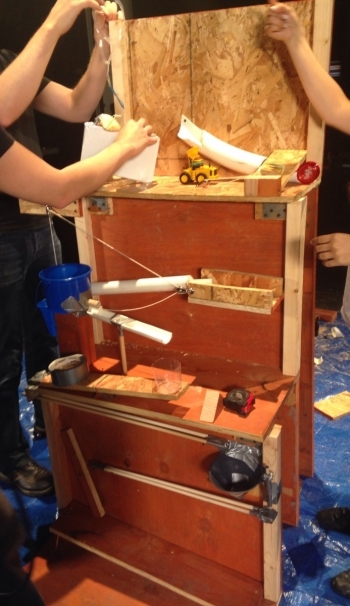 A Rube Goldberg machine is “an overly complex contraption, designed with humor and a narrative, to accomplish a simple task,” according to the national competition’s official website. Teams of high school and college students will compete beginning at 11:30 a.m. Saturday marks the second annual regional Rube Goldberg contest, which will showcase machines that erase a chalkboard in a unique fashion. The free event is hosted by Heal the Bay along with the Santa Monica Pier Corp. and presenting sponsor Time Warner Cable’s Connect a Million Minds initiative. Friedlander’s creation won’t be entered in the contest, but will add to the multitude of fun and innovative activities – from bicycle-powered ice cream to 3-D printing, to opportunities for all to build, draw, paint and create. The event takes place 11:30 a.m. to 5 p.m. on the east end of the Pier. The theme will continue at the Aquarium, where visitors can pilot an underwater ROV, capturing marine samples with mechanical claws. Friedlander calls the process of building a Rube Goldberg machine one of “creative trial and error with major contributions from everyone.” The six-member team did include one person with an engineering degree who creates video games for a living (Jason Wishnov) and a second, Timothy Ries, who Friedlander credits with using his construction skills to create the base of the machine. After about eight hours in the planning phase, the team — which also included Trisha Hershberger, Justin Langley, and Nate (goes by his first name only ) — spent a couple of hours to collect the necessary materials and another 14 hours building. So their baby is definitely a 24-hour labor of love. Built at YouTube’s studio in Los Angeles, the group created a time-lapse video as well, which will be available on Hershberger’s YouTube channel any day now. When watching the machine in action, notice how a shell became a key component to a crucial step. But the true secret ingredient? Lots of duct tape.